With a roster comprised entirely of underclassmen—including ninth-graders at first and second singles—many considered 2017 a building season for girls' tennis. The first match of the season, however, had Knights fans taking notice as the team posted a 5-0 straight-set win over Rutgers Prep. The following day, a hard-fought win over North Hunterdon showcased the team’s grit, as freshman Mayjah Jean-Pierre at first singles and freshman Ella Baker at second singles both earned wins after dropping the first set. The team recorded a 5-0 win over Vorhees on September 11, in which junior Andree Aloise notched a straight-set win at third singles. Aloise would remain a strong contributor throughout the season, winning ten matches. The Knights continued to dominate throughout September, anchored by stellar contributions at first and second doubles. The duo of junior Alexis Meola and sophomore Tori Goldin at first doubles dropped only a single match in September and, at second doubles, junior Hannah Cohen and sophomore Jess Bleier won every match. 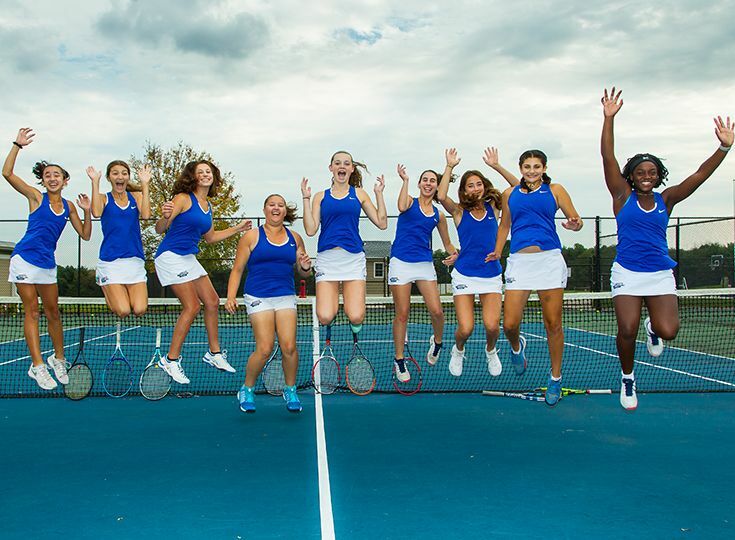 The team launched into October with a 5-0 straight-set win over Franklin. The next day saw a 4-1 in over Bernard's High in which sophomore Kerry Colford joined Cohen at second doubles for a straight-set win. Colford, and sophomore Caitlyn Matthews, split their time between the JV and varsity squads often filling in at second doubles. On October 10, the team posted a 5-0 win over St. Rose in the quarterfinals of the NJSIAA Non-Public B South tournament. Two days later, they notched about 5-0 win over Trinity in the semifinal round. The state tournament run ended on October 17 with a 3-2 loss to Ranney School. In the Prep B tournament on October 18, the Knights garnered a second-place finish, with Jean-Pierre and Baker claiming first and second singles, respectively. The season wrapped up a 4-1 win over Hun on October 19, bringing the team to 14-2 overall and 12-1 in their conference division. Stay tuned for season wraps from all of our fall sports as well as coverage of post-season honors.